2017 has been declared the Saint Ladislas (László) memorial year, to mark the 940th anniversary of Saint Ladislas (1077-1095) becoming the king of Hungary and the 825th anniversary of his canonization. One of the most popular Hungarian saints, Ladislas was the embodiment of the ideal Christian knight. He was canonized in 1192; his feast day is June 27. Ladislas I belonged to the Árpád dynasty and was the son of King Béla I and the Polish princess Richeza. He was born around 1040 in Poland and ascended the throne of the Hungarian kingdom in 1077 after decades of internal power struggle within the newly founded Christian monarchy. He died in 1095, and the two decades of his rule brought consolidation and relative peace, which was further preserved with the introduction of several new laws regarding the protection of private property and the judiciary system. The new cathedrals (Várad [Oradea] and Zagreb) and monasteries he founded, along with the canonization of his predecessors, King Stephen I and his son Emeric in 1083, strengthened the position of Christianity in the country. He died in 1095 and was buried at the cathedral of Várad. After the death of Ladislas, many healing miracles were associated with him and his burial place, and as a result, he was officially canonized in 1192, and shortly thereafter at the beginning of the thirteenth century his legend was written. Várad became the center of his cult and his head relics were put on display there in a marvelous reliquary bust. 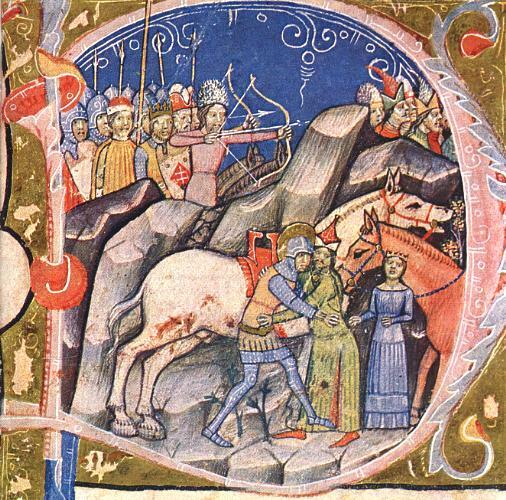 Apart from individual cult images, the most characteristic medieval depiction of Ladislas shows him in the 1068 battle of Kerlés against the Petchenegs (Cumans), in which Ladislas saved an abducted Hungarian girl. The painted narrative of this heroic struggle is found on the walls of countless Hungarian churches as well as in manuscripts. After the cathedral of Várad was destroyed during the Reformation and the Turkish wars, the relics of Ladislas were transported to Győr (1607), where they are kept today. A number of popular stories and legends are associated with his name, and László is still a popular given name in Hungary. The memorial year of 2017 provided an opportunity for numerous conferences, smaller exhibitions and a variety of other events, which are listed on the Facebook page of the year. Now as the year is coming to a close, the results of other projects carried out in the framework of the memorial year have also become available. I would like to call attention to two new websites, which provide further information about Saint Ladislas and his cult. 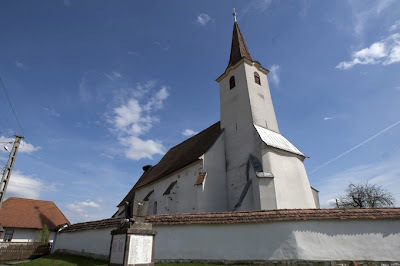 The website dedicated to Saint Ladislas, the knight king features various locations from Hungary and Transylvania with a connection to the Holy ruler. At the time of the launch, 44 locations connected to the history and legend of Saint Ladislas are featured. The project is an ongoing one, and will be developed to include other regions from within the Carpathian Basin. 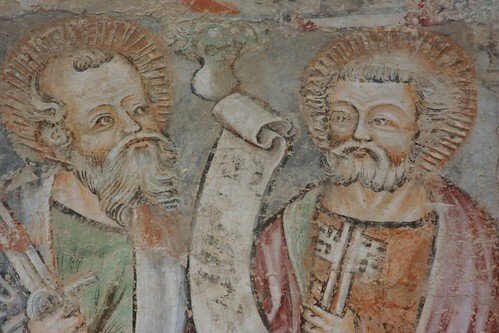 The website, which is available in English and Romanian as well, features a number of important medieval churches which are either dedicated to Saint Ladislas, or contain his depictions. It provides information and photos about the monuments, as well as practical information for visitor of the route of Saint Ladislas. There is even a route planner, where you can select medieval wall paintings, for example. The information provided about medieval monuments is well-researched and the image galleries provide great material on the churches. You may want to have a look at Bögöz (Mugeni), Gelence (Ghelinţa) or perhaps Türje - or just keep browsing. The other website, titled Szent László, focuses only on medieval paintings depicting the Legend of Saint Ladislas, more specifically the story of his battle against the invading Cumans, and the rescue of an abducted Hungarian girl. The painted cycle of this battle is perhaps the most significant contribution of medieval Hungary to the common heritage of the European Middle Ages. The complex and extensive cycle appeared within a short time all over the territory of the Kingdom, and was especially common in wall painting. For well over a century – during the reign of the Angevin kings Charles Robert and Louis the Great, as well as their successor, Sigismund of Luxemburg – the cycle was the most popular painted narrative in Hungary. If we count surviving monuments today, as well as a few examples only known from 19th century copies, we know just about 45 cycles of wall paintings with this narrative – and there are several other documented examples which have disappeared from the walls of churches. This website - developed by the Arany Griff Association (Odorheiu Secuiesc, Romania) - aims to collect images of these painted cycles. So far, they provide information on and photos of 32 painted cycles, which makes it the most comprehensive website on the legend. You can find images of the painted cycles from all over the territory of the medieval Kingdom of Hungary. I am currently writing a conference paper on Flóris Rómer, one of the founding fathers of Hungarian art history. Flóris Rómer was born 200 years ago, in 1815, and filled numerous important positions during his illustrious career. He became active in the field of archaeology and art history in the 1860, and published the first survey of medieval wall painting in Hungary in 1874. 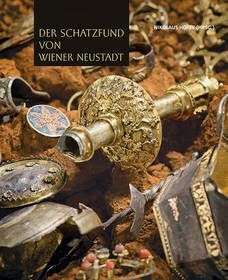 The book, which is in the focus of my study, is a beautifully illustrated, monumental work, published by the Archaeological Committee of the Hungarian Academy of Sciences. In the book, Rómer discusses over 100 medieval monuments with wall paintings, but the main focus is the work of Johannes Aquila, which Rómer effectively discovered in 1863. 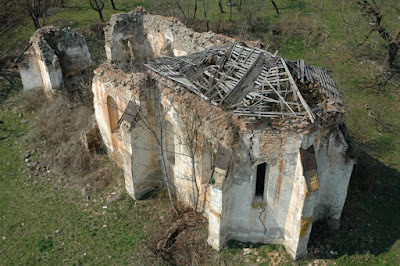 At that time, he was called by Imre Gozón to examine an abandonded medieval church in western Hungary, in the village of Velemér. The church had no roof or vaulting, but its walls were covered by a wonderful series of wall paintings. Surprisingly, Rómer also found a self-portrait of the painter as well, who called himself Johannes Aquila. The date of the frescoes was also recorded in an inscription: 1378. 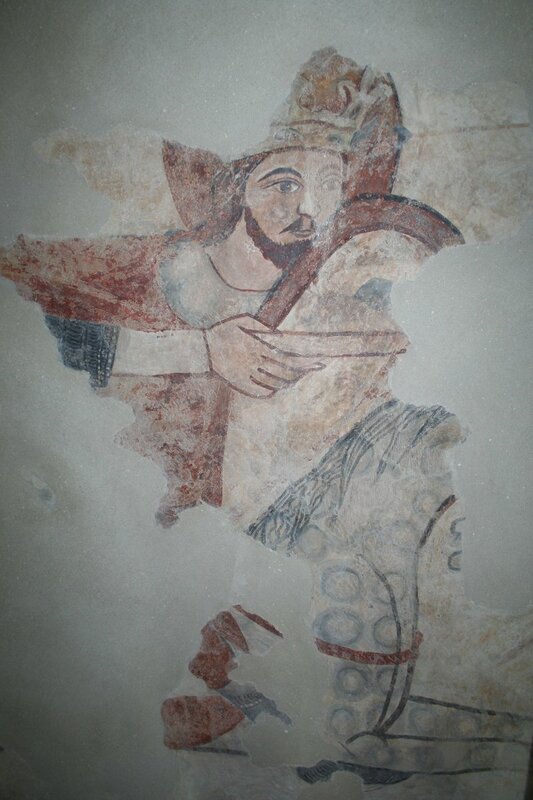 Rómer also found the frescoes of Johannes Aquila in the nearby church of Turniscsa (Toronyhely, Bántornya, now Turnišče in Slovenia): here he identified the legend of St. Ladislas in the frescoes located in the attic space, above the Baroque vault covering the nave of the church. 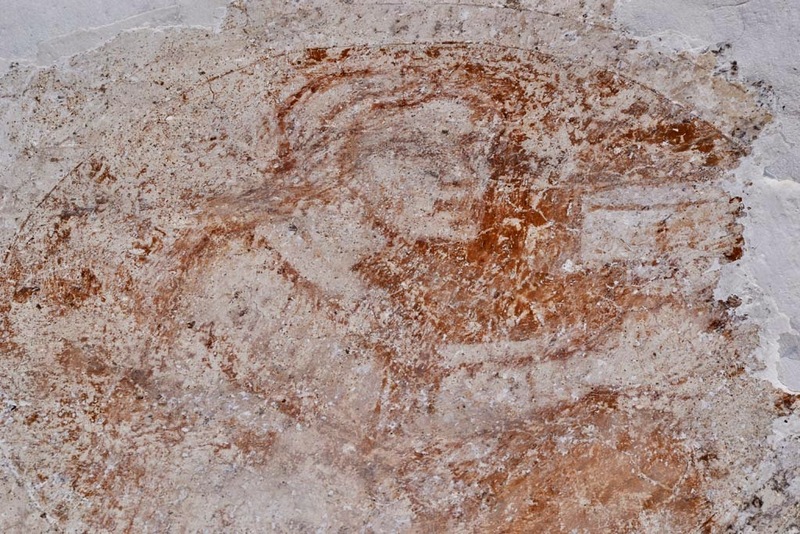 Another fresco cycle of Johannes Aquila - again with his selfp-portrait, and dating from 1392 - was found at Mártonhely (Martyáncz, now Martjanci in Slovenia). 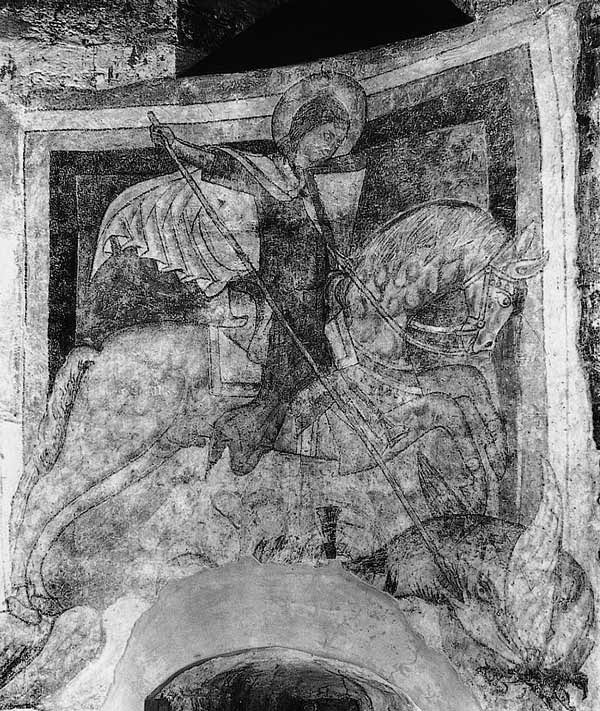 Rómer also attributed the frescoes in the rotunda of Nagytótlak (Selo, Slovenia) to Johannes Aquila. At the instigation of Rómer, Ferenc Storno made a set of color copies of the wall paintings, which were published in his 1874 monograph, and are still indispensible tools of research. Quite coincidentally, a series of these copies are currently exhibited at Műcsarnok (Kunsthalle Budapest), which is normally a place of contemporary exhibitions. The Johannes Aquila exhibition is part of an interesting mix of exhibitions, called the Slovenian connection, which are accompanying an exhibition of contemporary Slovenian painting. Whatever the reason, the Műcsarnok displays not only Storno's original notebook and sketches, but also the much more detailed large-scale copies executed by István Gróh in 1903 and 1912. These include watercolour copies, as well life-size replicas of the St. Ladislas cycle at Bántornya. In addition, the exhibition also includes a large-scale model of the interior of the church at Velemér, imagined and reconstructed at the stage when Johannes Aquila began his activities there, with the painting of the Adoration of the Magi. The curator of the exhibition is Terézia Kerny, who published a book on Johannes Aquila a few years ago (the current show is accompanied by a brief - but bilingual - booklet about the painter). Wandgemälde des XIII. und XIV. Jahrhunderts in der Eisenburger Gespanschaft" (pp. 201-215). "Johannes Aquila .... by his hands..." - The Slovenian Connection, on view at Műcsarnok-Kunsthalle Budapest until September 29, 2015. Some of my photos of the paintings of Johannes Aquila - along with other photos of medieval wall paintings in Slovenia - are available in my album on Flickr. 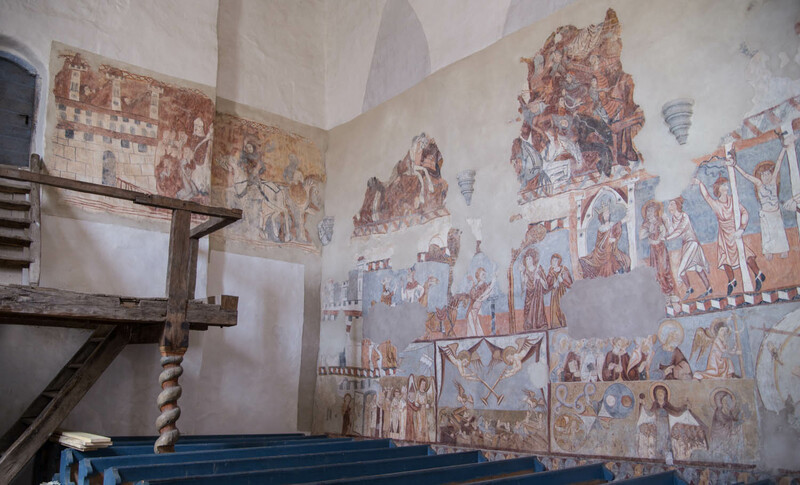 One of the largest restoration projects in Slovakia was completed in 2014: the restoration of the wall paintings in the sanctuary of the medieval church of Torna (Turňa nad Bodvou). 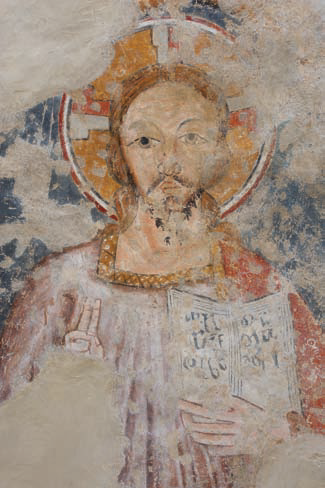 The frescoes, found in 2006, were uncovered starting from 2007, and their full restoration is now completed. 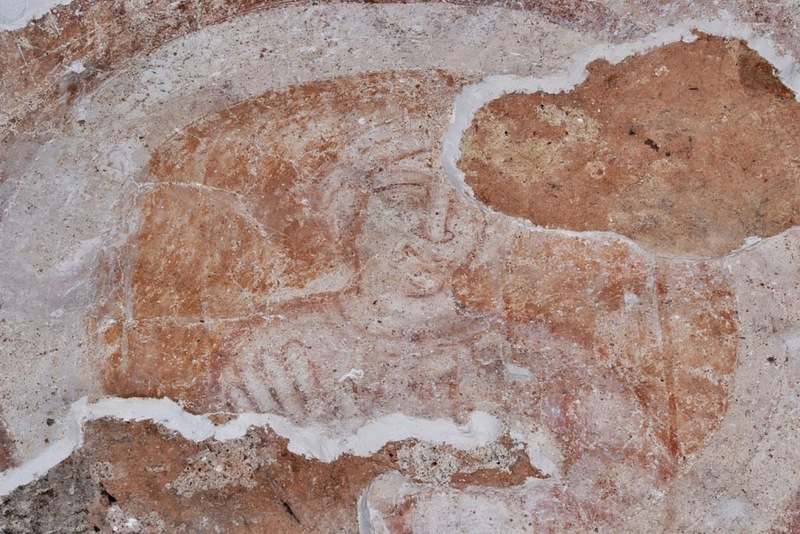 I contributed as an external art historical consultant to this work, and wrote a preliminary study about the wall paintings for the scholarly documentation of the frescoes. 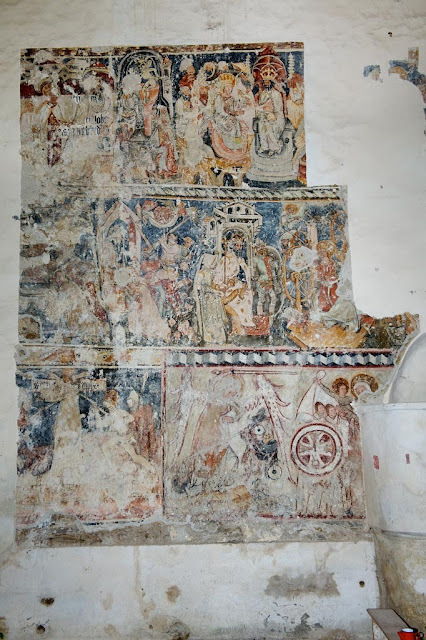 Although my study has not yet been published, I am now providing here a brief overview of the frescoes and their restoration. Torna is a medieval village in southern Slovakia, just north of the Hungarian border, not far from the town of Kassa/Košice. In 1357, the owners of the property received permission from the king to build a castle on top of the hill overlooking the village. The castle still dominates the landscape. It was the same family - the Tornai family - who had the parish church of the village built, in the second half of the 14th century. The last member of the family, János Tornai, passed away in 1406, his tombstone stands to this day in the sanctuary of the church. Although the sanctuary of church, intended as a family burial site for the Tornai family, was clearly completed before 1406, it was only decorated some time later, as I will discuss below. Until 2006, a nondescript neo-Gothic ornamental decoration covered the walls of the sanctuary, painted to harmonize with the neo-Gothic main altar of the church. 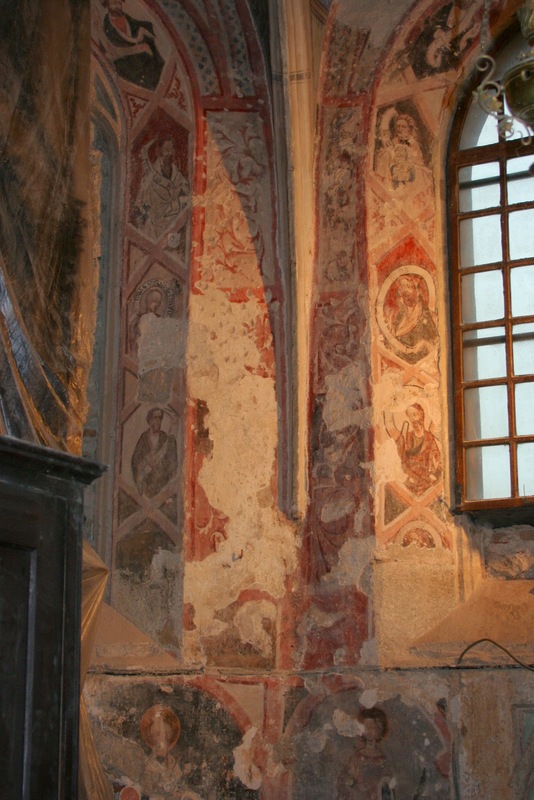 The frescoes were first found on the back wall of the Gothic sitting niches on the south wall of the sanctuary. As research and recovery progressed, it became clear that the entire sanctuary (including the vaults) was once painted according to a unified system. Although the first details to emerge from this painted cycle were very promising, unfortunately it turned out that the decoration is largely lost: large surfaces of the original painted decoration were destroyed during the centuries. The original decoration survived mainly on the eastern walls (behind the altar), on the lower zone of the wall as well as on the window splays. What was once an elaborate narrative cycle on the uninterrupted north wall of the sanctuary, however, is now lost almost without a trace. Still, enough remains from the painted decoration to establish its original arrangement, and surviving scenes attest to the high quality of this decoration. The most significant part of the decoration was a large, multi-zone narrative cycle, depicting the Infancy and Passion of Christ. Only a few of the scenes can be identified today, including the Nativity, and from the Passion: the scenes of Christ on the Mount of Olives and the Arrest of Christ. The scene of the Nativity belongs to the type of representation, in which Mary prays before her newborn son, who is lying on the ground. The region of Gömör county contains a large number of comparable cycles depicting the Life and Passion of Christ - for example Gecelfava/Koceľovce or Ochtina/Ochtiná but the quality of the frescoes at Torna is much higher. This weekend - the weekend after Saint George's Day - mark the 800th anniversary of the foundation of the Benedictine monastery of Ják. It is known that the monastery was established by Márton "the Great" comes from the Ják kindred some time before 1223 (when its abbot was first mentioned). Circumstantial evidence puts the date of this foundation to the year 1214. The abbey church was dedicated to St. George, who was a favoured saint in Hungary during the late Árpádian period, and one particularly liked by the Ják kindred. 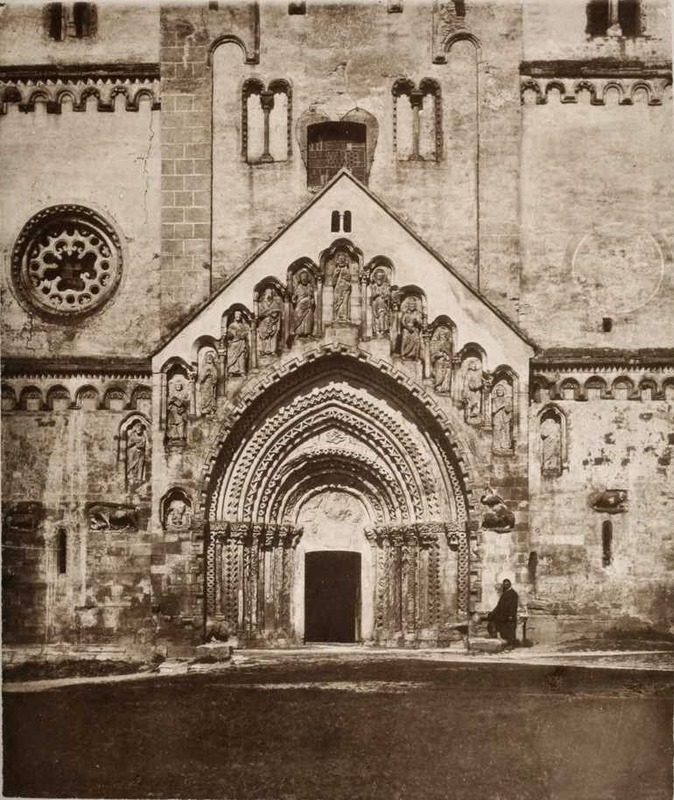 The abbey church, built in late Romanesque style, was finally dedicated in 1256. Construction thus lasted for a few decades, and was not without interruption. The church is one of the most monumental examples of early thirteenth century monasteries erected by noble families in Hungary - other examples include Lébény or Türje. It was built as a three-aisled basilica, with a massive western part with two towers and a gallery between them. Construction started on the northern side, then continued on the southern side in the second phase. After a change of plan it was decided to vault the entire church, and it was in this phase that the western area was also built. This phase of the work - during the 1230s - is characterised by strong connections with the building workshop of Bamberg cathedral. In the end, the church was not fully finished as planned - work was interrupted either by the Mongol invasion (1241-42), or by the death of Márton comes in 1250. The central and southern aisle of the nave was not vaulted, only covered with a flat wooden ceiling - but the church was considered finished by the 1256 consecration. The western portal of the church, as well as its additional carved decoration, and also its painted decoration make the church one of the most important 13th century monuments from Hungary. The rotunda standing next to the abbey church was also built in the 13th century, around 1260. The church was restored several times, most extensively between 1896-1906. The massive stone spires of the towers, and the vault of the central aisle were added at this time. Literature on the church is extensive, especially in Hungarian and German. You can find some photos on this website, including images taken before the late 19th century restoration. More recently, the exterior of the church was cleaned. 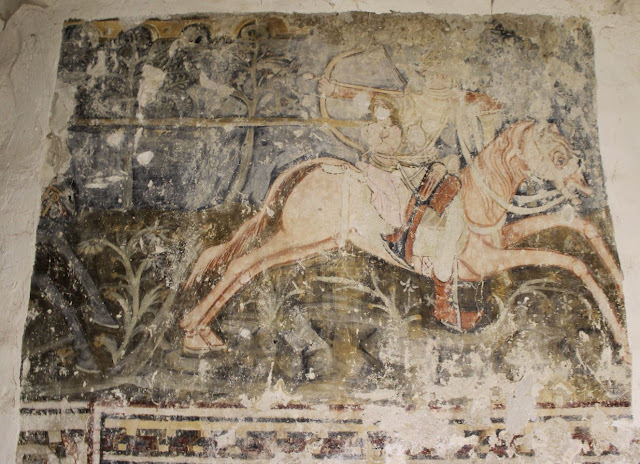 With the current festivities celebrating eight centuries of the Abbey, the goal of the organizers is to raise money for the restoration of the frescoes in the church, especially the fresco of St. George painted on the wall of the main apse. 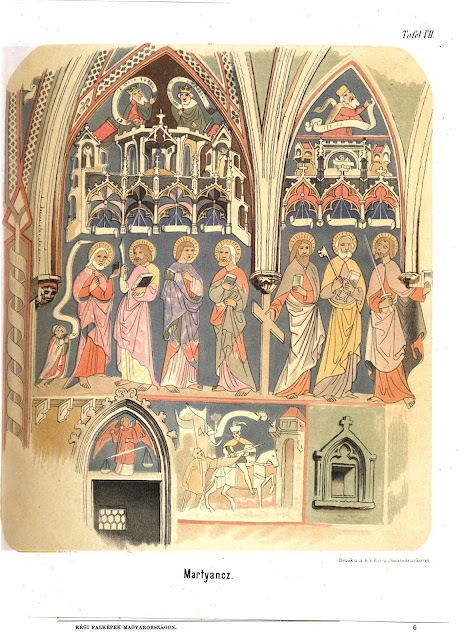 You can read my study on these frescoes, from a 2001 catalogue dedicated to Benedictines in medieval Hungary (the study is in Hungarian). Photos in Wikimedia Commons and on the website of Pázmány Péter University. Study and photos on the templom.hu website, data on the műemlékem.hu website. The village of Kövi (Kameňany, SK) lies in the vicinity of Rimaszombat (Rimavská Sobota) and Rozsnyó (Rožňava), just north of the modern border between Hungary and Slovakia. In the middle ages, the settlement had an important castle, the ruins of which can still be seen above the settlement of Gömörrákos (Rákoš). The castle was built by members of the Ákos clan in the late 13th century, and it was later owned by descendents of the family, the Bebek and Csetneki families. In 1367, it was described as a ruin, but was rebuilt by about 1400, when the Bebek family alone obtained possession of it. 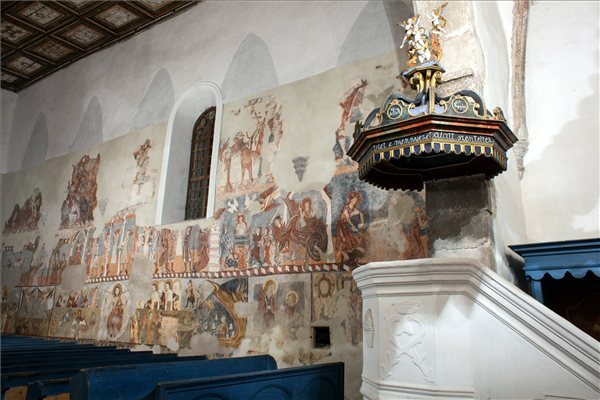 The parish church of Kövi dates also from the late 13th or only 14th century, and it has been known for some time that its walls preserve important medieval wall paintings. Parts of them were uncovered in 1977, but this work stopped soon afterwards. 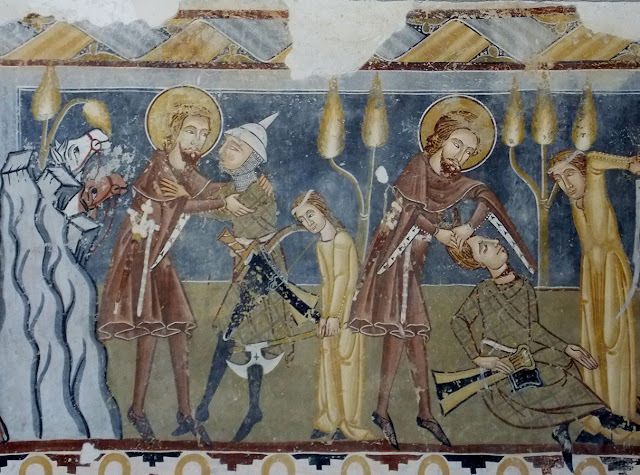 During the last few years, starting from 2011, the uncovery of these frescoes began again, and research so far has already yielded very important results. The frescoes have been uncovered on the walls of the semi-circular apse of the church, particularly on the northern wall. Here a series of the apostles can be seen, while the insede wall of the triumphal arch is decorated with female martyrs. Higher on the arch, the Wise and Foolish Virgins can be seen. 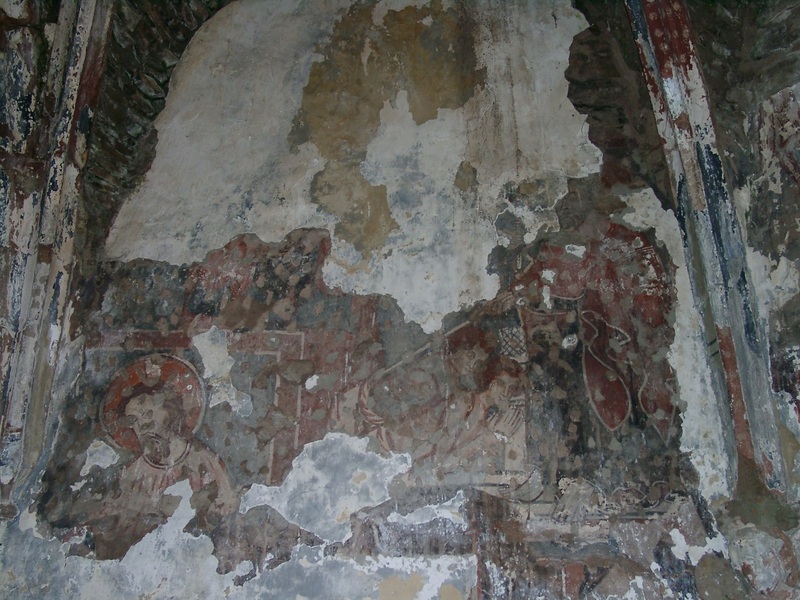 More recently, restorer Peter Koreň has uncovered additional frescoes on the north wall of the nave. Here an impressive composition the Virgin and Child with St. Anne (Mettercia) has been found, which shows the extended family of the Virgin. More frescoes are to be found in the attic of the church, above the Baroque vault built into the nave. Here details of a Last Judgement scene can be seen. 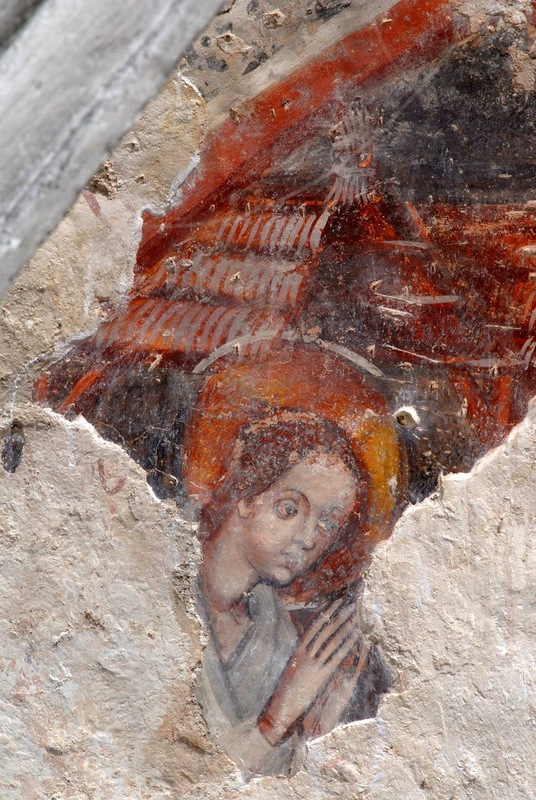 Photos of the frescoes can be seen on the very useful Slovakian portal of medieval churches, Apsida.sk. However, a picture of the St. Anne can be seen first on this blog, along with other images uncovered in the nave (I thank the restorer for providing me with images). 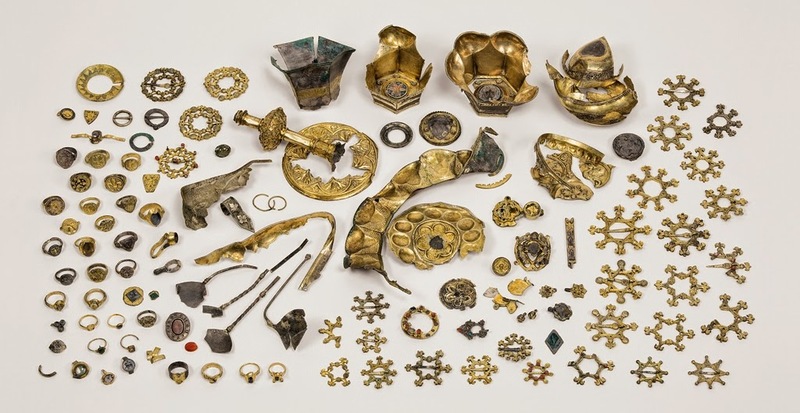 The finds at Kövi are of great importance. Although the frescoes appear to be somewhat fragmentary, their high quality can be seen, especially in some of the faces. A full uncovery of the ensemble and a careful restoration of the frescoes would result in a spectacular monument. The locality is important, because it is in a church which is right next to the medieval castle, which was one of the administrative centers of the region. The patrons of the frescoes were most likely the lords of the castle, so members of the powerful Bebek family. 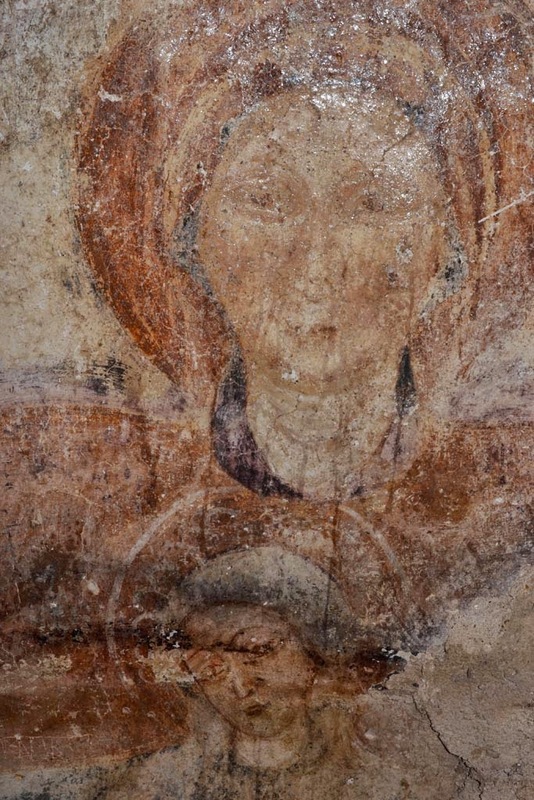 In the present state of research, the frescoes can be dated to the late 14th century or to around 1400 - but it has to mentioned that the frescoes of the nave and sanctuary date from two different painting campaigns. Overall, they appear to be related not only to nearby Gömörrákos, but also to the frescoes of the somewhat more distant Torna/Turňa nad Bodvou, a settlement near Kassa/Košice, the frescoes of which have also been recently uncovered. 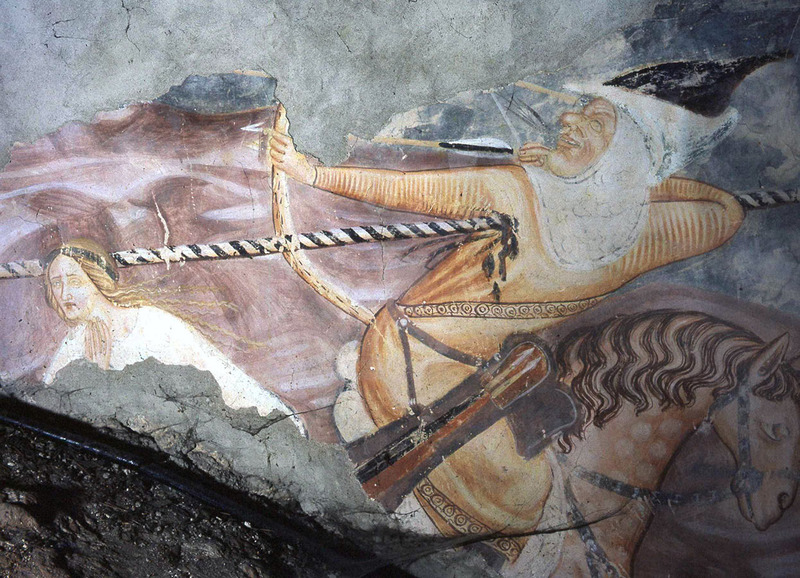 The full restoration of the Kövi frescoes will definitely considerably alter our knowledge of medieval wall painting in the region. 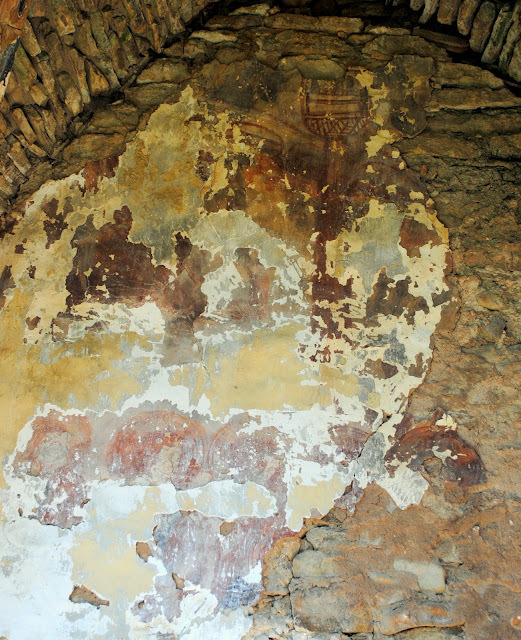 It has to be mentioned that the historical region of medieval Gömör County preserves the richest ensemble of medieval wall paintings from the territory of the medieval Kingdom of Hungary. Along with the countless impressive painted monuments in the region - places such as Csetnek/Štítnik, Karaszkó/Kraskovo, Gecelfalva/Kocelovce, Gömörrákos/Rákoš, Ochtina/Ochtiná and others - research during recent years uncovered even more, such as the frescoes of sanctuary of Pelsőc/Plešivec. The churches can be visited along the Gothic Route of churches. It is to be hoped that within a short time, Kövi will become an important stopping point on this route. As this blog is aimed for an international audience, I generally only write reviews of books published in English or other western languages. However, in this post I would like to call attention to a few books published mostly in Hungarian last year. This monograph, written by an art historian - a long-time curator of the Museum of Fine Arts - is a welcome addition to the literature on the Crown of St Stephen. 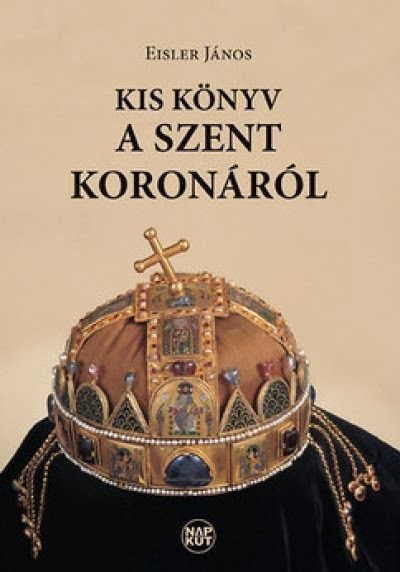 Not too much in detail has been written about this unique object in recent years - a basic bibliography is available on my webpage dedicated to the Hungarian coronation insignia. Unfortunately, the subject of the crown has been hijacked by authors far removed from the framework of scholarship, putting forward one crazy theory after the other about the supposed age and power of the crown. János Eisler, however, concerns himself with the actual historical, political and theological questions of 11-12th century Hungary: the period when the crown was created. I am looking forward to reading it. More details on the publishers website. Középkori egyházi építészet Erdélyben - Medieval Ecclesiastical Architecture in Transylvania, vol. 5. Edited by Péter Levente Szőcs. Satu Mare, 2012. This is the fifth volume in a series of conference proceedings, edited by Péter Levente Szőcs, and published by the County Museum of Satu Mare. 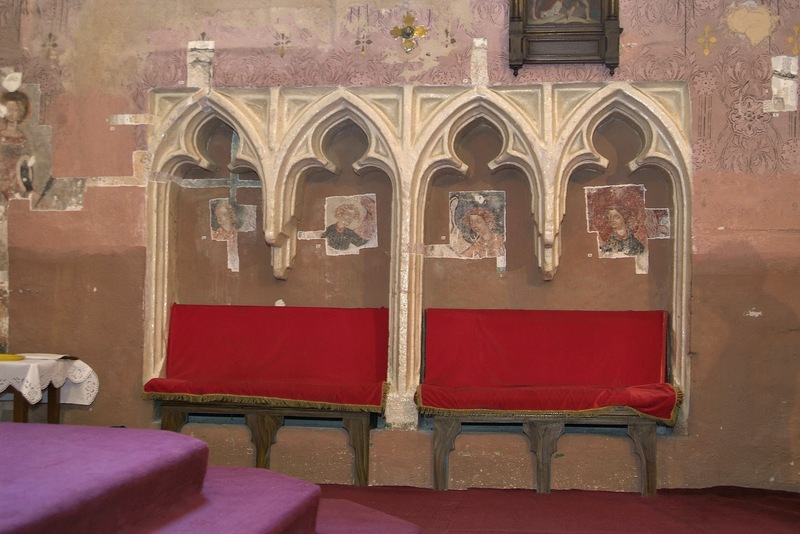 As was the case with the previous volumes, the subject matter ranges from Romanesque architecture to late gothic church furnishings, in this case from four-lobed Romanesque churches to the rood screen of the parish church of Szeben/Sibiu and the wall paintings of Segesvár/Sighisoara. One study I found particularly interesting is Radu Lupescu's analysis of the western portal of the Church of St. Michael in Kolozsvár/Cluj, featured on the cover of the book. The studies are published in various languages: Hungarian, Romanian, English and French, with summaries generally in English. The list of studies can be consulted here. The book was published with the support of a EU-funded Hungarian-Romanian cross-border research project, about which you can read on the project website (Patronimium2). A szórvány emlékei (Monuments of the diaspora). Ed. Tibor Kollár. Budapest, Teleki László Alapítvány, 2013. This is another, much more lavishly produced book on medieval architecture in Transylvania. 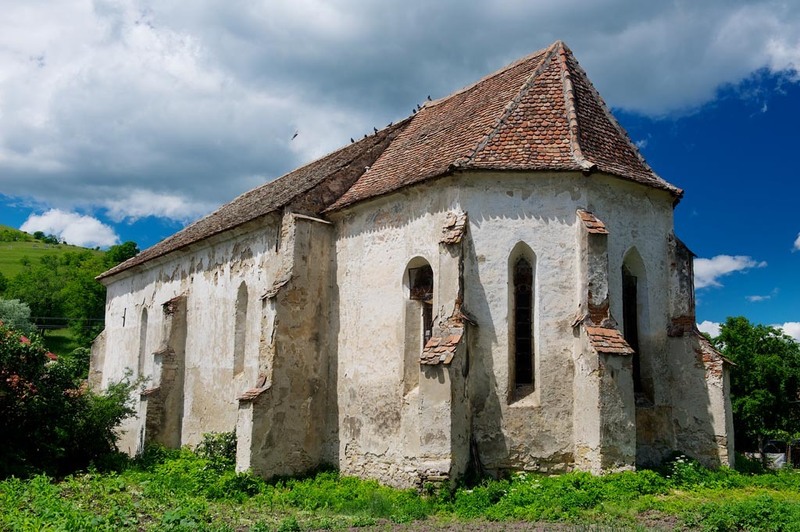 The book aims to publish medieval churches which had been abandonded by their original builders (Hungarians and Transylvanian Saxons) in southern Transylvania, due to historical circumstances. In addition to architecture, the book also focuses on medieval wall-painting, mainly on newly discovered monuments. The books makes available a whole new set of material for researchers of medieval art, not just in the studies but also in the large number of brand new photographs. The book was edited by Tibor Kollár, who became known as the organizer and editor of a series of books on Hungarian medieval architecture. The contents of the present volume are listed (in Hungarian) on the publishers website. My study in the book can be read here (a summary is available right here on the blog). Közös tér - Közös örökség. Common space - Common heritage. Edited by József S. Sebestyén. Budapest, 2013. 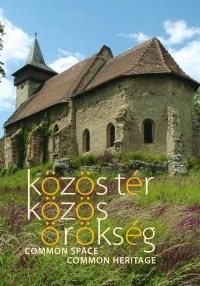 This bilingual book documents the results of a long-term project funded by the Hungarian government, aimed at restoring monuments of mainly medieval Hungarian architecture from regions outside of the borders of modern Hungary. In ten years an amount of roughly 7,5 million dollars was spent on restoring approximately 300 architectural monuments related to Hungarian cultural history. Subsidies were mainly directed towards archeological studies, professional conservation, restauration and preservation efforts, but also included at times funding earmarked for making future use of monument buildings possible. This book, which grew out of an exhibition series, present this work, seeking to offer a glimpse into the wealth of architectural monuments bearing witness to the cultural history of centuries past. 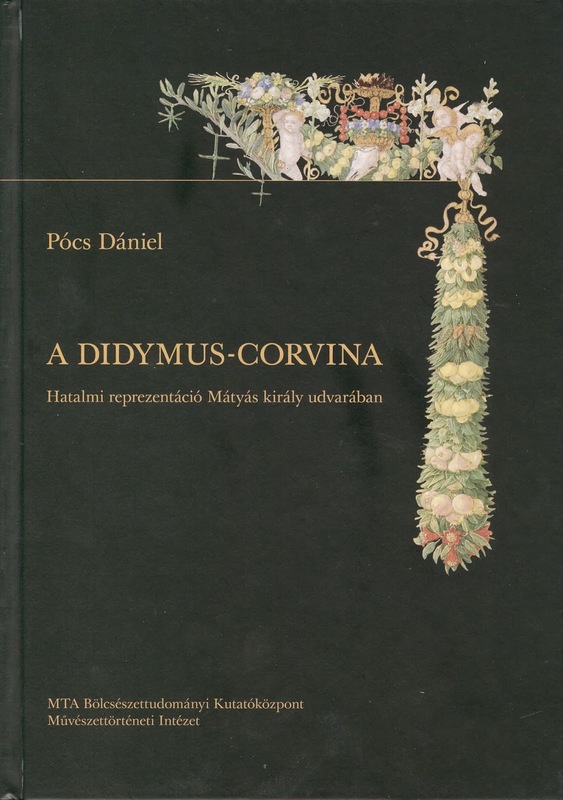 Dániel Pócs: Didymus-corvina - Hatalmi reprezentáció Mátyás király udvarában (The Didymus Corvina - Representation of power at the court of king Matthias Corvinus). Budapest, 2013. Dániel Pócs, one of the researchers who participated in the organization of last years Florentine exhibition dedicated to art at the court of Matthias finally published a book based on his doctoral dissertation, the subject of which is political iconography at the court of Matthias. The starting point of his analysis is one of the most splendid manuscripts commissioned by the king, the Didymus Corvina (New York, Pierpont Morgan Library, MS M.496). The book is an important addition not only to Corvina-studies, but also to art history of the Matthias period in general. An earlier study of Pócs on the manuscript is available in English as well: Pócs, Dániel: "Holy Spirit in the Library. The Frontispiece of the Didymus corvina and neoplatonic theology at the court of king Matthias Corvinus", in: Acta Historiae Artium, 41, 1999/2000, pp. 63-212. There were quite a lot of things I wanted to report on at the end of 2013. I hope to come back to these subject individually in the near future - for now, I can only give a brief listing of these news. After a restoration process of about 13 years, the palace chapel of Esztergom chapel finally reopened to visitors. During this period, the chapel was completely inaccessible, as heavy scaffolding was erected inside. The chapel, which was built at the end of the 12th century, is the most important Early Gothic building in Hungary. It was decorated with a wonderful cycle of frescoes, painted in the 1330s - the best example of Italianate frescoes in Hungary. During the Turkish wars, the chapel, along with the royal (later archepiscopal) palace next to it fell to ruin, and was only uncovered between 1934-38. 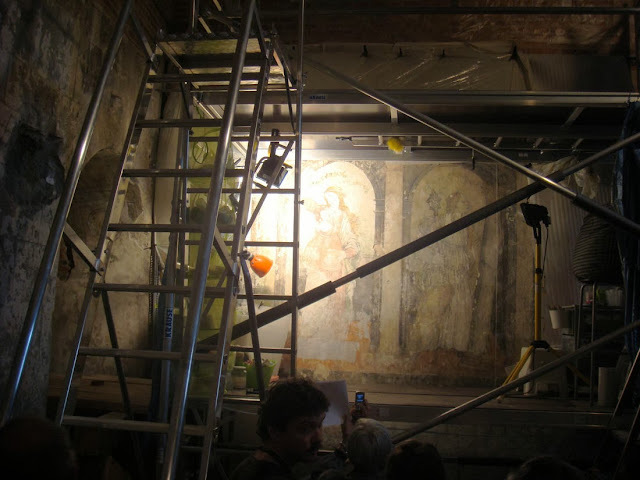 The restoration of the Renaissance frescoes in the adjoining room still goes on, and will probably be completed in 2015. The website of the Castle Museum of Esztergom (a branch of the Hungarian National Museum) provides very basic information about visits to the chapel. The press kit, which can be downloaded from the website, provides a few photos of the frescoes in their restored state. The photo used here is from the press kit. 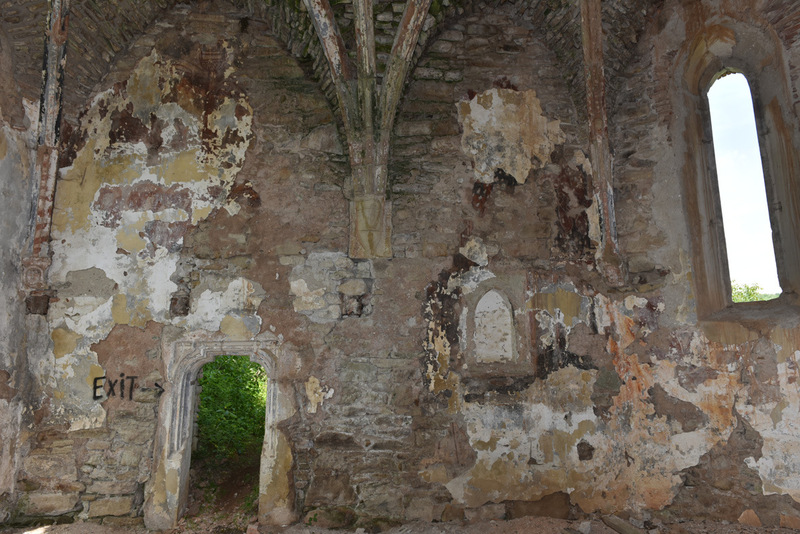 A full architectural and photogrammetrical survey of the palace chapel and adjoining spaces - which was carried out in connection of the restoration - is available on the website of the company who made the survey. Reports on the reopening of the chapel were made by Hungarian press, see here and here, for example. For more photos, go to Archeologia - Altum Castrum Magazin. 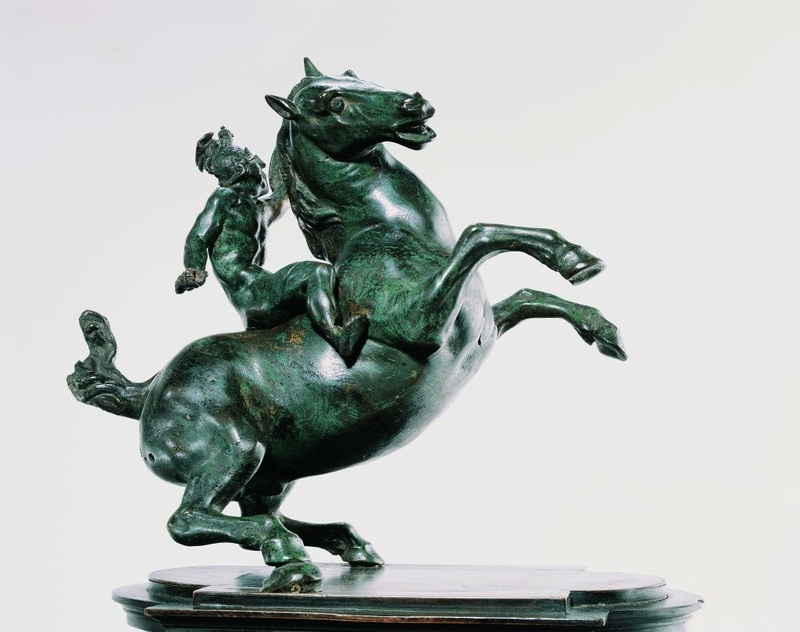 Horse and rider attributed to Leonardo da Vinci. "The sculptures of the Museum of Fine Arts, housed in the deposits for the past 25 years, are now presented in newly renovated rooms on the second floor of the museum. The Department of Sculpture collection includes nearly 650 European sculptures covering six centuries of artistic creation from the Middle Ages to 18th-century Classicism. The exhibition encompasses over 100 artworks, from various styles and periods, including German Late-Gothic, Italian Renaissance, and Austrian Baroque. Among the exhibited masterpieces are German sculptor Tilman Riemenschneider’s (circa 1460-1531) wooden sculpture, referred to as Madonna and Child, Italian architect and sculptor Jacopo Sansovino’s (1486−1570) unique wax sculpture entitled Madonna and Child, and the extraordinary Austrian Baroque sculptor Franz Xaver Messerschmidt’s (1736−1783) Character Heads. In addition to displaying the most celebrated sculptures, the museum’s exhibition also provides insights into the secrets and special production techniques of the workshops. Throughout the centuries, sculptors have experimented with several types of material, including wood, stone, ivory, terracotta, and various alloys of metal. Furthermore, over time artists developed numerous methods for decorating and painting their sculptures and reliefs. Conservators have applied the original methods and traditional materials and techniques to make samples, thus highlighting the important details of the displayed sculptures and enabling the viewer to observe and follow the various stages of the creative process." You can continue reading on the website of the museum. Interesting things are happening elsewhere in the region as well. 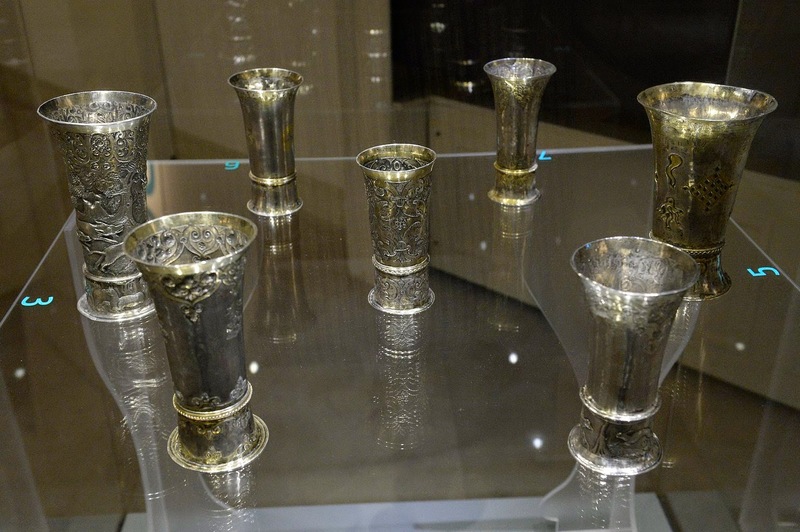 The Gallery of Medieval Art finally reopened at the National Museum in Warsaw. The exhibition of the Master of the Liechtenstein Castle remains open until February 23, at the Belvedere in Vienna. Finally, the exhibition on the Florentine connections of Hungarian Renaissance art is closing this weekend in Florence. Once more on "Botticelli in Esztergom"
It has recently been stated by the Hungaarian government that new financial sources have been provided for the completion of the restoration of the medieval castle complex in Esztergom, in particular that of the early Gothic castle chapel and the adjoining spaces, which are decorated with frescoes. 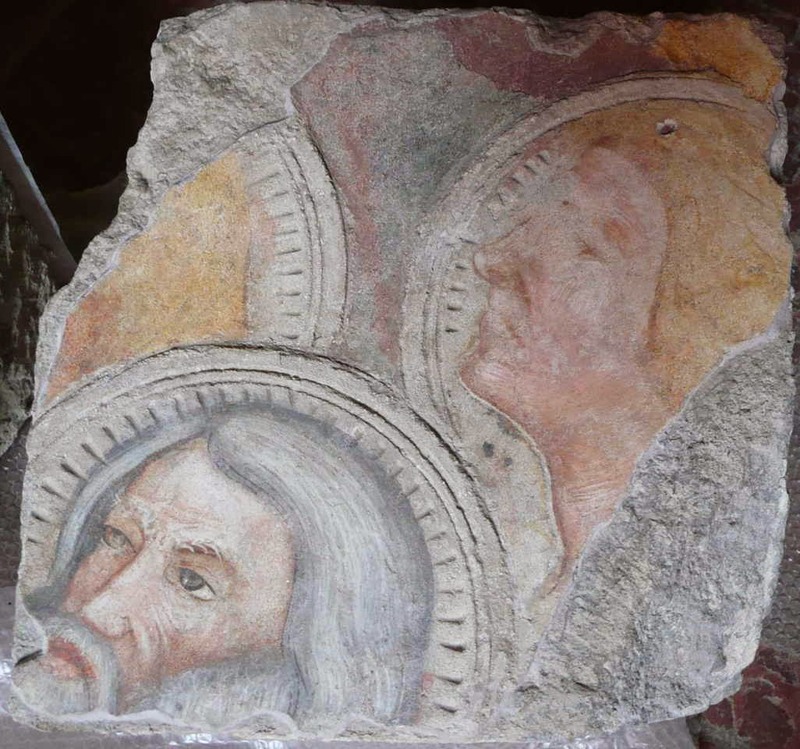 The 14th century frescoes of the chapel as well as the late 15th century frescoes of the so-called 'Studiolo' have been under restoration since 2000 - an impossibly long time. With the new funds, the end maybe is in sight - the chapel will be accessible again as early as next Spring, while the frescoes of the Studiolo will be on view again in 2015. Recently, most attention has been given to these Renaissance frescoes, following the sensational claim made by restorer Zsuzsanna Wierdl and art historian Mária Prokopp in 2007 that the figure of Temperantia from a series of the Virtues was painted by the young Botticelli, who was in Hungary during the 1460s. Although disputed soon after the announcement, the authors keep repeating this claim, which has been published in various places - including the acts of the 2007 conference on Italy and Hungary in the Renaissance, held at Villa I Tatti in Florence. I reported on this claim and some response it received in an earlier post. According to an article published this week in Hungarian daily Népszabadság, the authors claim that their attribution of the fresco to Botticelli has gained acceptance and has not been refuted until now. 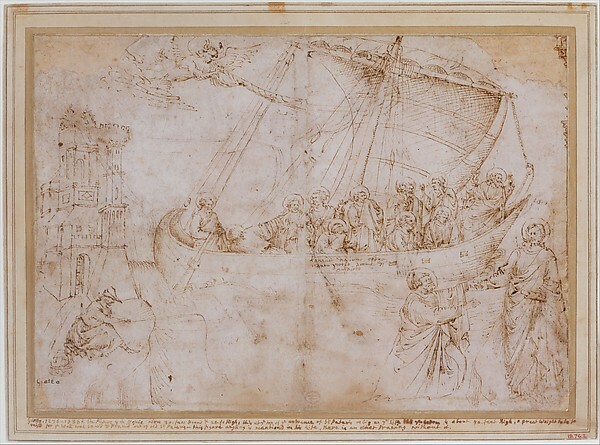 In fact, they now believe that all surviving figures of the Virtues can be attributed to Botticelli. Well, Népszabadság may not be an authoritative source on questions of attribution - but it is definitely wrong on the issue of responses to the Botticelli-attribution. Let's see a few publications on the subject! First, I would like to call attention on the publications of Mária Prokopp and Zsuzsanna Wierdl. The attribution to Botticelli was first presented at the Villa I Tatti conference held in 2007 - the conference volume has since been published, with texts by both authors on the subject. The authors have also published a Hungarian-language book on the subject, and their arguments have been summarized in a number of other publications, for example in Rivista di Studi Ungheresi in 2012. If you would like just a quick overview, read the article by Mária Prokopp, published in Hungarian Review. In addition to stylistic and historical arguments, the attribution rests on the interpretation of the letters MB incised in the frescoes, supposedly referring to "(Alessandro di) Mariano, detto Botticelli". Two years ago, I already reported on the Route of Medieval Churches project, which focuses on medieval monuments in North-Eastern Hungary, and neighbouring regions of the medieval Kingdom of Hungary, which now lie in Romania and the Ukraine. The project has been going ahead during that time, and by now reached another important milestone. 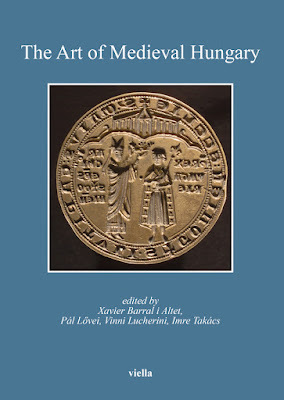 This means first of all the publication of an all-new volume, which focuses on medieval churches in the north-eastern region of medieval Hungary, much of which now lies in the Ukraine (the region of Carpatho-Ukraine). 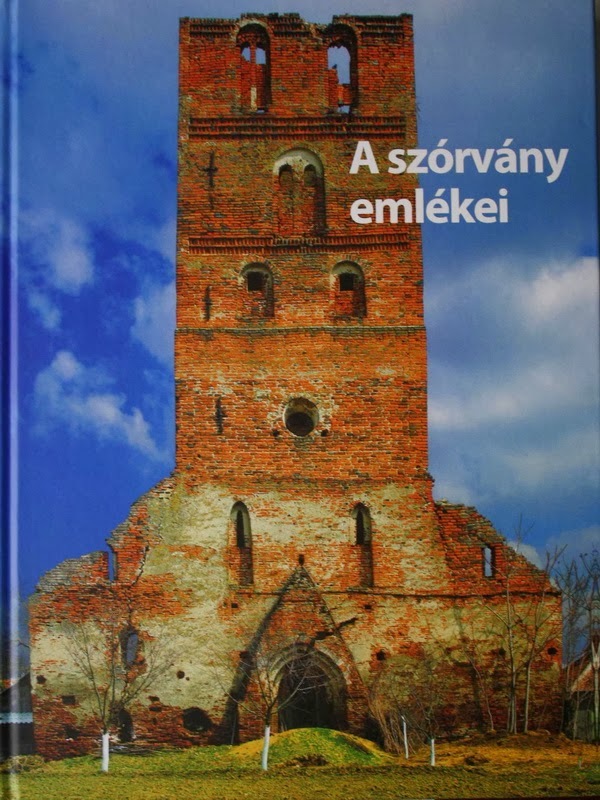 The book, titled Medieval Churches from the Tisza valley to the Carpathians has been published both in Hungarian and Ukrainian versions. 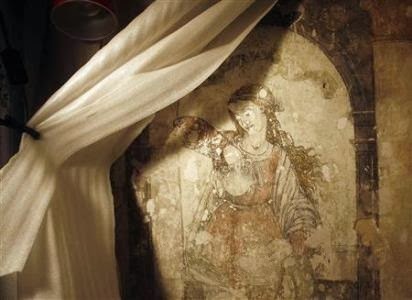 It treats several well-known monuments, such as the 13th century rotunda of Gerény with its 14th century fresco cycle, as well as a number of newly discovered medieval monuments, including a large number of medieval wall paintings. All of this is the result of research carried out during the last three years, coordinated by the editor of the book, Tibor Kollár. The publication joins the earlier volume, which focused on medieval monuments of historic Szatmár county. PDF-versions of both publications can be downloaded - in Hungarian. It is worth to do so simply for the all-new illustration material contained in these volumes. Another new result of the project is a completely rewamped new website, which is available in several languages. The website outlines the goals and results of the entire EU-funded touristic and research project, and gives detailed information about the medieval churches of the region. Start browsing in English - it is definitely worth it. 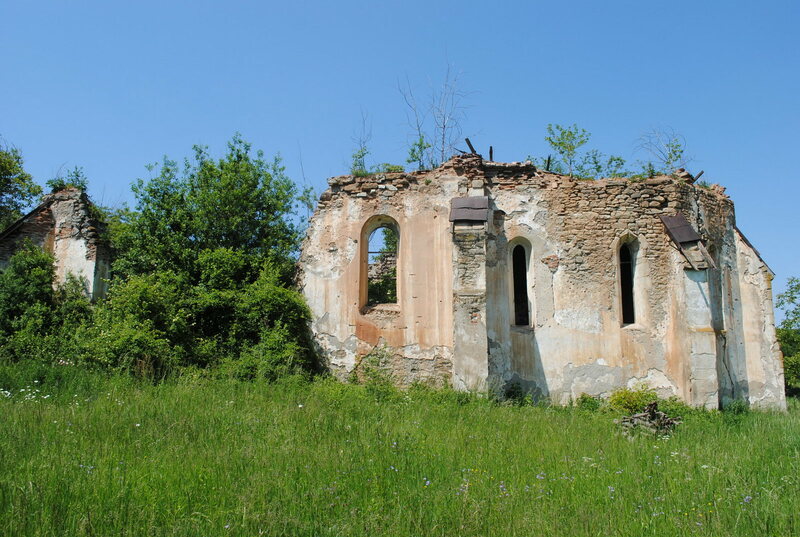 Check out such famous gems as the church of Csaroda, long thought to be the most characteristic medieval church from the Arpadian period (before 1301), but now dated to the early 14th century. 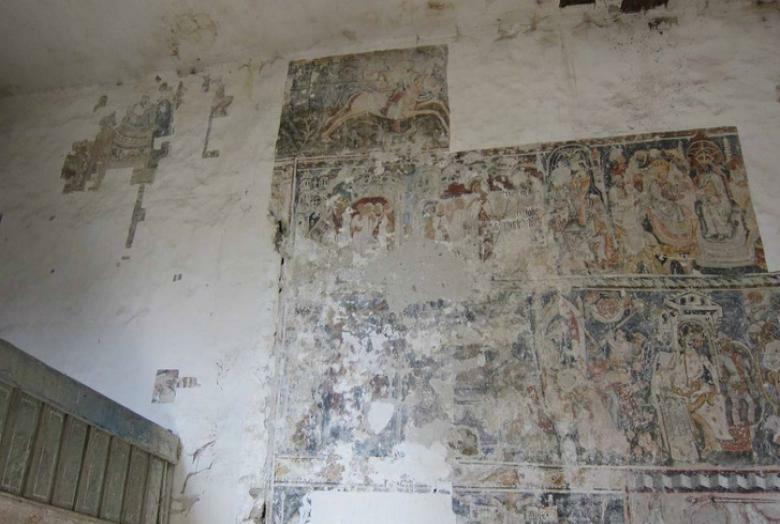 Have a look at it twin edifice in Transcarpathia, the church of Palágykomoróc - where last year frescoes painted by a workshop known from Csaroda were found. 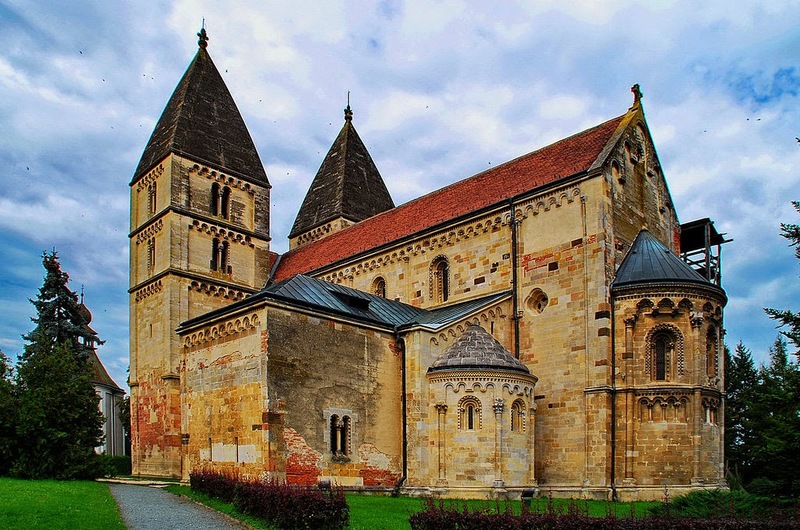 Explore the church of Ákos, the most significant Romanesque monastery church in Eastern Hungary, or the little-known church of Nagybégány. But most of all, go an explore the region in person - thanks to this EU-project, there is plenty of information available to organize such a trip. As an inspiration, I am including here a few photos taken during my most recent trip in the region. One of my favourite medieval churches is at Bögöz (Mugeni, RO), in Transylvania. The north wall of this church is covered with a rich ensemble of 14th century mural paintings, which were discovered in 1898. Fur much of the last 100 years, these frescoes were in a very bad condition: dirty, discoloured and crumbling. 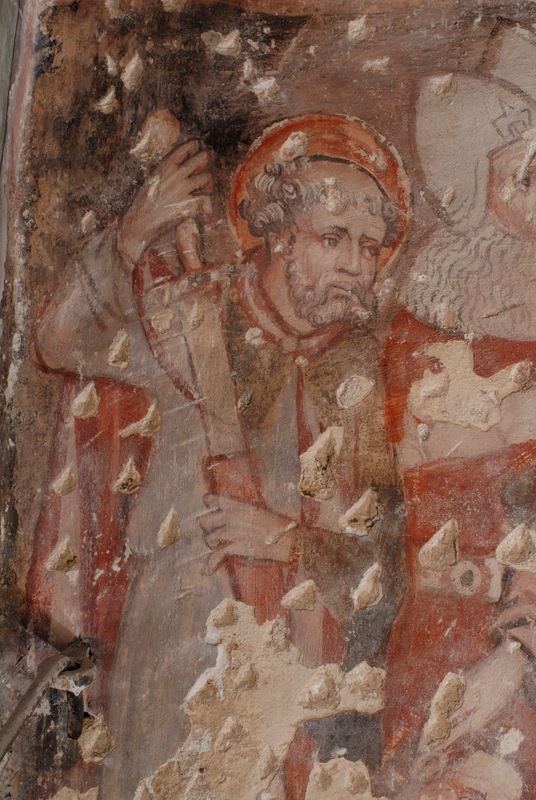 Finally, by the end of last year, the frescoes were cleaned, conserved and restored. Despite their somewhat fragmentary state, they are now much more visible. I wrote a small book on the church and its frescoes in the middle of the 1990s. In the following, I will give a brief overview of the monument, based on my earlier text. The text is illustrated by new photographs of the frescoes, most of which I received from the restorer, Loránd Kiss. Before we start, have a look at the pre-restoration state of the church, on the Treasures of Szeklerland website. Select 'Mugeni' from among the churches - and take a virtual tour of the exterior and interior of the church. The village of Bögöz is in the middle of Udvarhelyszék, on the left bank of the river Nagyküküllő. The village was first mentioned in the sources in 1333 and 1334, as part of the Archidiaconatus Telegdiensis. The settlement at that time was one of the larger villages of the area, and it maintained an important role in later centuries as well. During the fourteenth century, several noble families from the village were mentioned in documents. The sources between 1481 and 1505 often mention a certain John of Bögöz, later captain of Udvarhelyszék, who certainly must have played an important role in the late Gothic rebuilding of the church. 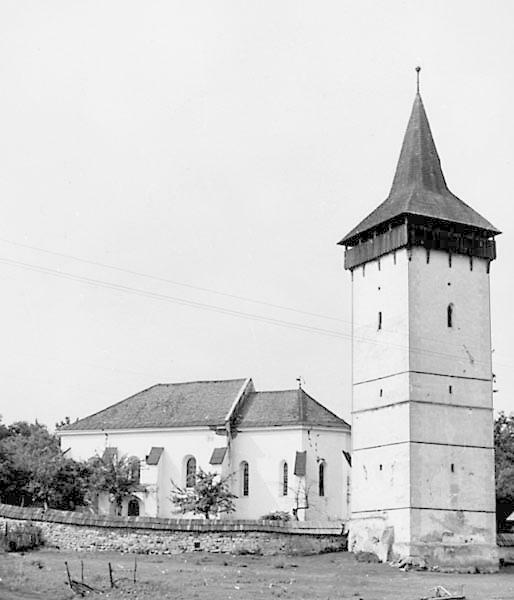 The church is now Calvinist, and its building is surrounded by a simple wall. The church consists of three main parts: a large western tower, nave and sanctuary. The simple nave and the bottom parts of the tower are still from the Romanesque period, and the foundations of the original, semicircular apse were discovered inside the present late Gothic sanctuary. Thus the original church must have been built in the 13th century. The nave had been vaulted with a net-vaulting probably at the end of the fifteenth century, but this vaulting was later destroyed, and only the corbels in the wall survived. The nave is now covered with a painted coffered ceiling from 1724. The elaborate stone-vaulting of the sanctuary and its sculpted corbels have survived up to the present day. The wall-paintings of the church are preserved on the north wall of the nave. József Huszka discovered them in the summer of 1898, and published his results and copies in the same year. The present condition of the paintings can be compared with the two sets of Huszka’s copies - the sketches in the Ethnographic Museum, and the final versions in the collection of the OMvH.